President Barack Obama today urged a revival of two devastating mortgage policies that helped inflate the real estate bubble before the economic crash of 2008. “Let’s make it easier for qualified buyers to buy homes they can,” he said in a campaign-style speech in Phoenix, Arizona, today. “We should simplify overlapping regulations and cut red tape for responsible families who want to get a mortgage, but who keep getting rejected by banks,” he said, echoing President George W. Bush’s support in 2002 for lower lending standards. Obama, like Bush, also urged greater immigration. Conceding that this totally unrelated item from his laundry list was “something you don’t always hear about when it comes to the housing market,” the president claimed an influx of new and in many cases low-skill immigrants will spur home buying and house prices. This time around, Obama insisted, massive government interference in the private real estate market would not produce the catastrophe Americans endured in the last decade. “I hope everybody here learned some hard lessons from what happened… It was kind of crazy,” Obama told his Phoenix audience. “So what we want to do is something stable and steady,” he said. Obama’s proposal to stimulate the real estate sector echoes Bush’s call in 2002 to spur home-buying by immigrants and African-Americans. “When we meet this project, this goal… we will have added an additional $256 billion to the economy by encouraging 5.5 million new home owners in America… [and] the additional demand will be upwards of $256 billion,” said Bush, at a 2002 event at George Washington University. “A lot of folks can’t make a down payment,” Bush said at the time. “They may be qualified. They may desire to buy a home, but they don’t have the money to make a down payment… One way to address that is to have the federal government participate,” he said. Through 2006, increasing federal guarantees of debt, combined with higher-risk lending policies established by President Bill Clinton, drove up personal debt rates and created a real-estate bubble. When real estate demand cooled in mid-2006, overextended borrowers began defaulting at record rates, demolishing the thriving market for debt and wiping out at least $17 trillion in household net worth, according to the Federal Reserve. The bubble was strongest in southern and western states with many low-wage immigrants, such as California and Nevada. Between 2000 and 2010, immigrants accounted for almost 40 percent of new homeowners nationwide, said White House statement Tuesday. The 2007 crash took down much of Wall Street, roughly halved the median wealth of Hispanic and African-American households, helped Obama win election in 2008, and has boosted unemployment to a new highs. Since then, wages have also fallen steadily, making it more difficult for many people to buy homes. Obama played a minor role in the Bush-era bubble. While working as a lawyer and state Senator in Chicago, he encouraged African-Americans to get mortgages, even if they had little income and bad credit ratings. A 2012 investigation by the Daily Caller showed that half of his clients foreclosed or declared bankruptcy. Since 2008, agencies have rolled back some of the Clinton and Bush rules. For example, home buyers must now show banks they have some savings and a good credit-record before they can get a federally-backed mortgage. However, Obama’s regulators are now pushing banks to make more loans to people with poor credit scores. In a set of talking points sent to reporters prior to the speech, Obama’s staff suggested that people with credit scores as low as 620 should get loans. “There are still millions of families with strong enough credit profiles to qualify for a mortgage but who are nonetheless being denied loans… [and] lending to borrowers with credit scores between 620-680 declined by roughly 90%,” said the statement. “For many of these borrowers, they are denied a loan because lenders are unclear of the rules of the road for lending and are protecting themselves by only lending to those with the most pristine credit,’ said the talking points. The president’s comments fly in the face of all accepted lending practices and abundant data showing the chances of default consistently rise as borrowers’ FICO scores decline. “People with very low scores have very high delinquency rates,” said Glenn B. Canner, a co-author of a 2007 report to Congress by the Federal Reserve on credit-scores and foreclosures. A credit score of “680 is an OK risk, but not great…. [at] 620 is where you start getting into risk populations,” Canner told The Daily Caller. The evidence is “pretty unambiguous,” Robert Avery, another economist at the Federal Reserve, told TheDC. “The higher the score, the fewer delinquencies,” he said. Obama’s Phoenix speech is part of a series of “cornerstone speeches” in which he blames the GOP-led Congress for the stalled economy. Obama was inaugurated in 2009, but the nation still hasn’t regained the jobs lost during 2008 and 2009. 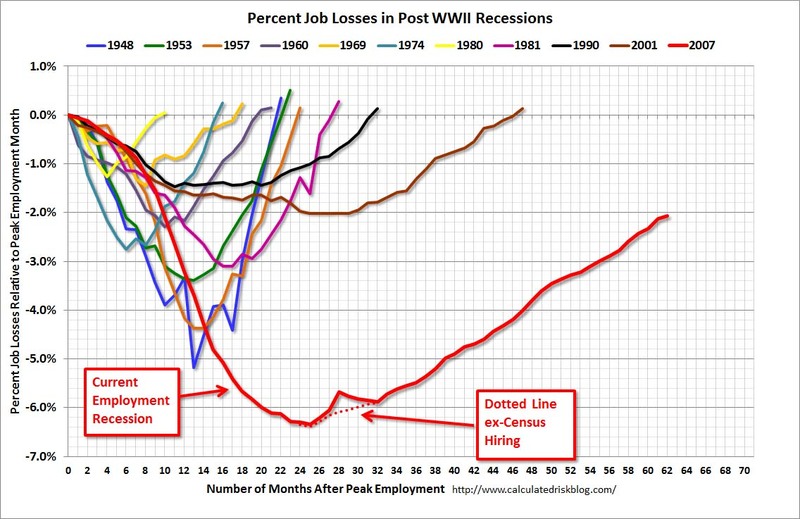 Job creation under the Obama administration is the worst the United States has experienced since at least the end of World War II. The speeches are intended to shape public attitudes prior to the fall budget debates and the 2014 election, when Obama is expected to urged voters to punish Republicans for stymying economic growth. “If we follow the strategy I am laying out for our entire economy: for jobs, housing, education, healthcare, retirement, and climbing the ladders of opportunity, then I have no doubt we will secure that better bargain where hard work is once again rewarded with a shot at a middle-class life,” he claimed. Even as he promised a greater role for government in the real-estate sector, he ridiculed critics for saying he wants a greater role in the nation’s real-estate sector. “I know that must sound confusing to the folks who call me a socialist… [but] I believe … our housing system must have a limited government role,” he said. He also suggested that the Bush-era bubble was caused by the two government-backed private companies, Fannie Mae and Freddie Mac. “We’re ending those days, we’re not going to do that any more,” he insisted. In fact, Fannie Mae and Freddie Mac have an even larger role in the mortgage market today and guarantee more mortgages than they did during the Bush administration.